Claim is the latest example in a string of anti-Israel propaganda, as "peace talks" set to begin. In what is being described as yet another example of Palestinian Authority (PA) denial of the Jewish connection to Jerusalem and the very legitimacy of the State of Israel, the Presidential Guard of Palestinian Authority Chairman Mahmoud Abbas has claimed the Western Wall as an Arab and Islamic site. 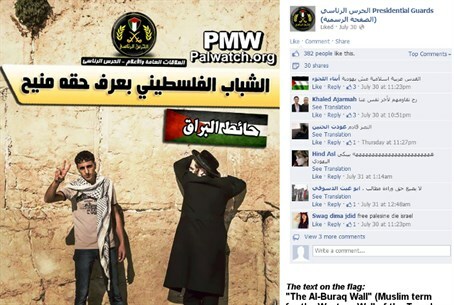 Palestinian Media Watch (PMW), an NGO which monitors incitement, anti-Semitism and anti-Israel propaganda on Palestinian Arab TV, has revealed that last week, a picture of the Western Wall was posted onto the PA Presidential Guard's official Facebook page with a PA flag superimposed on it, along with the words "The Al Buraq Wall - Public Relations and Information - The Presidential Guard - Palestinian youth know their rights." The Western Wall is a relic of the retaining wall of the Holy Temple in Jerusalem, which was destroyed by Imperial Roman in 70CE. For nearly 2,000 years Jews were prevented from worshipping on the Temple Mount, Judaism's holiest site, and instead prayed at the wall, which has since become a holy site in its own right, at which millions of Jews congregate to pray each year. Ongoing restrictions on Jewish prayer on the Temple Mount mean that the Wall is still the primary place of Jewish worship in Jerusalem. "Al Buraq" is the name given to the Western Wall by Arab rejectionists, who deny the Jewish connection to Jerusalem. They claim that the wall has nothing to do with the Jewish Temples, despite overwhelming evidence to the contrary; instead, they assert that it is the place where Muhammed tethered his mythical winged horse Buraq hundreds of years later, when according to some Islamic legends it transported him from Mecca to Jerusalem and back - despite the fact that Jerusalem is never mentioned in the Quran. PMW noted that this is only the latest example of PA rejectionism and denial of the Jewish people's claim to Jerusalem and the Land of Israel, as a way of rejecting the State of Israel's very legitimacy and right to exist. Despite the start of much-lauded "peace talks" between Israel and the PA, Arutz Sheva has reported on the continued campaign of anti-Israel and anti-Semitic propaganda and incitement to violence by the PA through its official organs. For example, last week the PA's official TV station broadcast a crudely anti-Semitic program which legitimized violence against Jews in Judea and Samaria, who were stereotyped as violent thieves. The end of the program glorified the humiliation of a religious Jew by cutting off his peyot side-curls, in a scene chillingly reminiscent of Nazi anti-Jewish propaganda. Other Ramadan broadcasts include a re-run of a music video encouraging violence against Israelis, and the glorification of the murderer of 61 Israeli civilians on the official Facebook page of Mahmoud Abbas' Fatah party. Recently, an anchor on the PA's official news station declared that a future "Palestinian state" would extend from Rosh Hanikra in northern Israel to Eilat in the south - effectively wiping Israel off the map. These incidents and others led to Israeli PM Binyamin Netanyahu complaining directly to US Secretary of State John Kerry, who has been pushing the Israeli government to enter into talks with the PA.